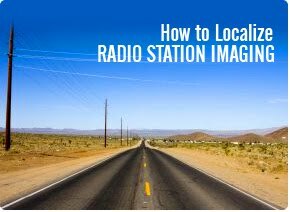 What does it take to localize your radio station imaging? The radio imaging world nowadays is packed with plug and play services which give you plenty of convenience. It allows any small market station to SOUND LIKE those big guys, without having to spend too much time on the production room. However, the comfort of fully depending on subscription based imaging services deprives the station to sound local. More often than not, imaging directors rely on pre-produced sweepers, which are good for those quick jobs, but don’t necessarily say MUCH about the personality of the station. This is where localizing comes into play. The idea is to infuse a native flavor into your production. Now, the first thing that comes to mind about this subject is integrating the city of license with your station IDs, which is very common. You hear radio stations that go with slogans like “Evanston’s Easy Rock”, “New York’s Hit Music”, and there are those that brand their stations alongside the city of license, like “Metro Manila’s 99.5 RT”. This is the first step in localizing your station sound. But, this is only one of the many ways, which basically implies that you don’t need to add a “city” beside your station’s slogan or call sign. Let’s use an illustration. We’ll take for example the imaging for KKWF, 100.7 The Wolf in Seattle. They had this copy for one of their station promos. Mentioning the place Tacoma does not necessarily qualify this one as a localized ID. But having to mention a recent major highway widening and associate that with “delivering so much fresh country” is just very LOCAL! The idea is to take a major happening or a recent event in your locale and incorporate that with your imaging, that is localizing! Take anything that is synonymous to your market, it can be yearly Mardi Gras, a delicacy, prominent personalities, anything that is local. Another example here, a morning show ID for WLYF morning show personality Susan Wise. WLYF’s market in southern United States experiences extreme weather conditions, and what better way to metaphorically introduce morning show host Susan Wise, than to compare her hair with a category 4 hurricane. Both examples are sprinkled with a dash of humor, which most producers agree, is an effective ingredient in increasing listener retention. The very purpose of adding a local touch to your radio imaging is to make your listeners feel at home with your station. When they know the station they are listening to identifies with them, knows what’s happening around them, it makes them STICK. Plug and play production services are very helpful. They are just one of the many ways you can improve the sound of your station. But don’t just rely on them. Be creative with your copy. Don’t just mention your city of license and go yell “we are planet Earth’s best music station”. To localize your station sound means to sound, and feel local, to add humor, and, above all, to be creative. All audio materials remain property of their respective owners.